Have you ever had something so close to perfection, yet its one blemish makes it so far from ideal? It’s like a nearly-perfect meal. The sauce is delectable, the side dishes are superb, and (if you’re into that sort of thing) you even have the perfect wine to go with the meal. The only problem? The meat is dog food. That’s the problem facing the Boston Red Sox right now. And third base is their dog food. Look around the rest of the diamond in Fenway. They have arguably the best outfield in the majors with Andrew Benitendi, Jackie Bradley, Jr., and Mookie Betts. Xander Bogaerts is one of the top shortstops in an era where there’s heavy competition at the position. Dustin Pedroia is on the downswing in his career, but he’s a team leader that can still field his position. Mitch Moreland is a Gold Glove-winning 1B with a knack for hitting in the clutch, and Christian Vasquez and Sandy Leon provide a good one-two punch behind the dish. 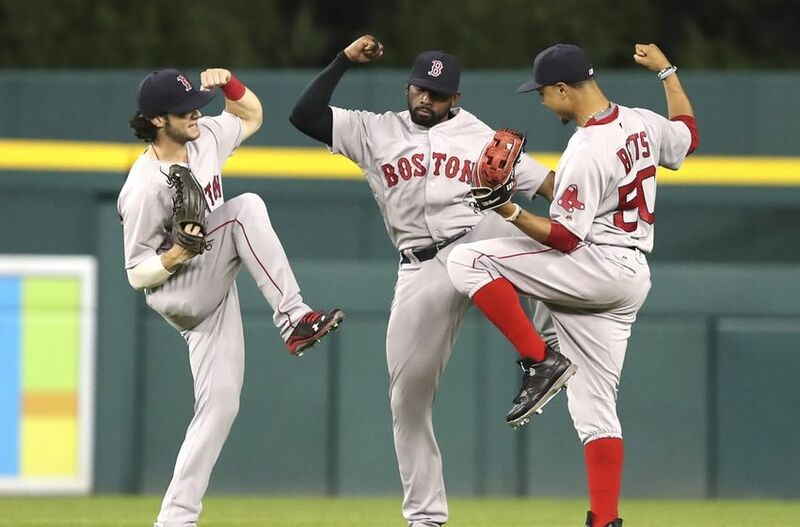 Win, Dance, Repeat: Boston’s outfield has a case for being the best in MLB. I haven’t even gotten to their three-headed monster in the rotation with Chris Sale, Rick Porcello, and David Price. Though Porcello and Price have struggled, the bullpen has picked them up in a big way. Joe Kelly, Heath Hembree, and Matt Barnes can all hit triple digits on the radar gun, and Craig Kimbrel is unquestionably one of the top relievers in the game, if not of all time. The Red Sox aren’t just eyeing the AL East title; they want the World Series. But then we get back to third base. Coming into the season, General Manager Dave Dombrowski and Manager John Farrell trusted the hot corner to expensive free agent signing Pablo Sandoval. The hero for the San Francisco Giants in 2012, Kung Fu Panda had never panned out with the Red Sox and had only appeared in three games in 2016. But there was optimism in Spring Training; Sandoval arrived to camp in good physical shape, and batted .338/.348/.677 in 21 spring games. A slimmed-down Sandoval hit well in the Spring, but couldn’t translate that success to the regular season. If Sandoval isn’t the answer at the hot corner in Boston, who is? Josh Rutledge is the primary back-up to Sandoval, but his .224 average and extreme lack of power won’t win him the job. Rutledge is also on the disabled list with a concussion, meaning the Sox need at least a warm body to put in the field. Enter two utilitymen. Deven Marrero primarily plays at the keystone, but can do service at 3B if needed. On Saturday the Red Sox called up Tzu-Wei Lin from Double-A Portland; he started at 3B on Monday, going 1-3 at the bottom of the order. Tzu-Wei Lin has been tearing up the Eastern League in Portland, batting .302/.379/.491 for the Red Sox affiliate. While he should provide a decent stop-gap at the position in the meantime, there are few in Boston that believe he provides a long-term solution to the Red Sox’s 3B woes. Tzu-Wei Lin got his first major-league hit last night, but does not have a ton of upside long-term at third for Boston. The Red Sox have three realistic options outside of hoping Tzu-Wei Lin surprises everyone. The first is an overly-optimistic reliance on over-the-hill veterans. 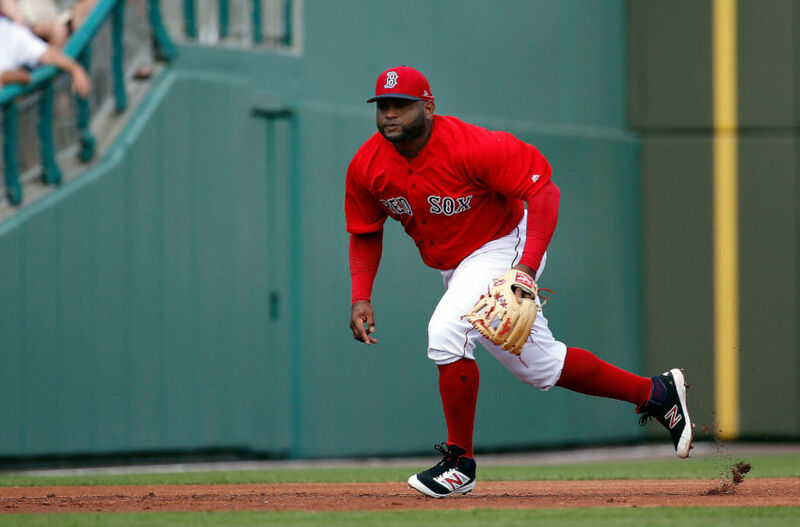 Pablo Sandoval is starting a rehab assignment at Triple-A Pawtucket this week alongside recent acquisition Jhonny Peralta. Both have struggled in recent years–Peralta hasn’t been the same since his suspension as a result of the Biogenesis investigation–and it seems highly unlikely that either could re-discover their stroke and contribute either offensively or defensively for the Red Sox. The second and most likely course of action sees Boston making a move at the trade deadline to pick up a third baseman to plug their one hole. Early in the season the Sox were linked to Royals’ 3B Mike Moustakas, but the Royals’ recent climb up the standings means they’re not guaranteed to be sellers come July. Much of the talk around third base has centered around Orioles’ third baseman Manny Machado, but it seems highly unlikely the Orioles will move him midseason, let alone to a division rival. A slam-dunk option could be Todd Frazier from Chicago. He has struggled this season (just a .211 average), but the Red Sox would have to gamble that he could turn it around with a change of scenery. Even so, acquiring Frazier would likely cost a hefty amount of prospects, which might would bankroll Boston’s future for a player that may not produce when needed. Which brings us to Option 3: Rafael Devers. Since sending Yoan Moncada to the White Sox in exchange for Chris Sale, Devers has been the Red Sox’ top prospect, and he just so happens to ply his trade at the hot corner. At Double-A Portland, he’s slashing .291/.354/.550 with 14 homers and 45 RBI batting in the middle of the Sea Dogs’ lineup. Devers is raw; he’s only twenty years old, and his defense can be sloppy, particularly in high-pressure situations. But his performance with the bat has already raised some eyebrows in Boston; Dave Dombrowski recently suggested that Devers is close to a promotion to Triple-A Pawtucket. Banking on Devers is a bit of a risk, but it’s the best option for the Red Sox. Peralta and Sandoval will not produce at third, and should not take up space on the big league roster. Any third baseman the Red Sox might pursue at the deadline will demand a steep return in prospects–which after this winter’s moves are in limited supply in Boston’s system. Devers is far from a sure thing, but he’s likely to produce more than Sandoval or Rutledge and will do so without the hefty cost in prospects. 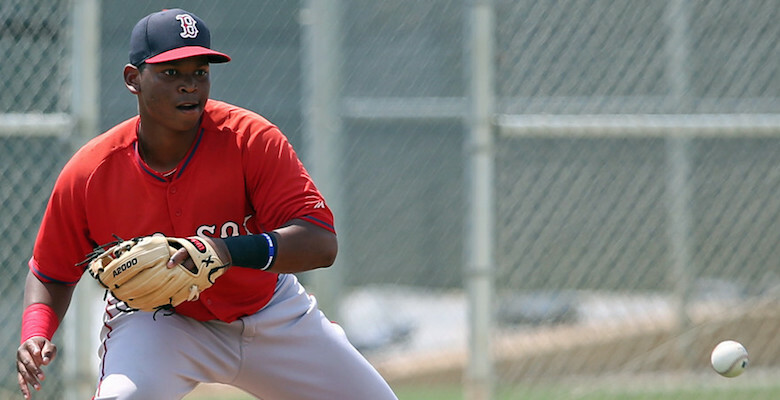 Rafael Devers: the answer at third base? He just might be. Devers needs a bit more time to marinate in the minors, but I’d expect the Red Sox to hold off at the deadline and bring him up in late-August to help for the late-season push into the playoffs. If he can produce for the Bo-Sox at third base, watch out; the Fenway Fanatics will be loaded up for another push at a World Series title. Previous Post: Could we have Two ROY/MVPs in 2017?